A pack of nine x 50m spools of pure spun silk thread in beautifully co-ordinating colours. Silk Palettes have been created from the shades of Regency 100% spun silk. It is a silk with a beautiful lustre and adds luxury and quality to all types of projects that will be treasured for years to come. The packs of nine spools have been carefully selected to create five gorgeous ranges of complimentary shades ideal for project work. They make the perfect gift for the discerning textile artist. lease note that the colour selection may vary slightly from the images but are based on the shades listed. For larger quantities of any shade please see our Regency 50g cones for a more economical way of buying a particular colour. Spun silk is the classical thread for both hand and machine embroidery and will add a touch of luxury to any piece of work. Also use in tassels and braids, lacemaking and tatting for superior lustre. Although these are small spools, there is enough to add gorgeous highlights to weaving projects, especially when tablet woven into the highest quality straps and plaits. 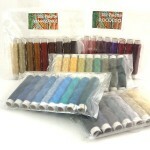 The spools tone beautifully together, so none of the colours stand out leaving you with shades you won’t want to use. 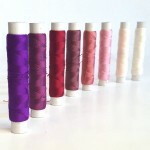 You don’t have to buy too much per shade meaning it’s an economical way of buying and using pure silk.